Rich Middlemas, '97, earned an Oscar for best documentary film at the 2012 Academy Awards in Hollywood. The film: "Undefeated," about a Memphis HS football team. 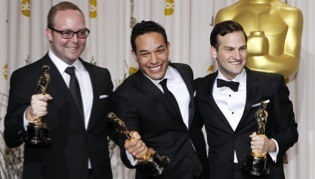 Beta Sigma Alum Rich Middlemas, '97, left, celebrates 2012 Oscar with his film team. House Corp. group accepts contribution from 1977-82 classes. Front: Mike McGuiness '73 (Architect); Kenan Smith '80 (House Corp.); Michael Brezina '02 (Chapter Advisor); Breckenridge Grover '69 (Beta Sigma's only living Order of Constantine). Back: John Troutman '82 ('77-82 Reunion); Sam McCamy '77 (outgoing Chapter Advisor); Mark Tarver '79 (both House Corp.); Jim Zasowski '83 ('77-82 Reunion); and Nick Zasowski '11 (2010-11 Consul). Tim Burchett, '86, now Knox Co. Mayor, addresses the House-Dedication crowd.